Camille and I headed to Miami last Sunday to see what parrot species we could get. Using Bill Pranty’s “A Birder’s Guide to Florida”, we hoped to beef up our life lists with some “easy” to get exotic birds. 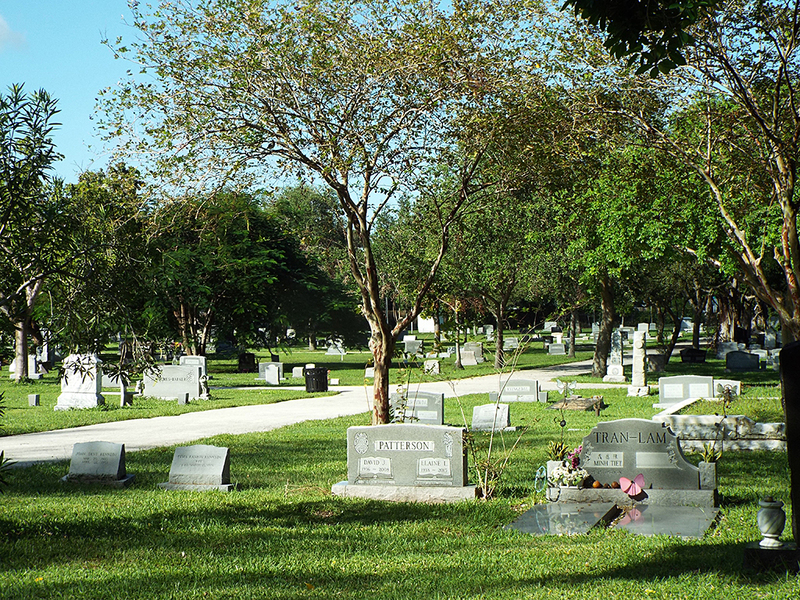 On our way, we couldn’t pass up an opportunity to visit Evergreen Cemetery in Ft. Lauderdale [map]. This cemetery is a lovely spot for migrants and the occasional vagrant or exotic. This is where many birders flocked to see the Variegated Flycatcher a couple of years ago. Evergreen Cemetery is a beautiful green space and a known migrant trap. As an aside, Leslie Nielsen is buried here. The place was hopping with warblers, including American Redstarts, Black-and-White, Bay-breasted, Cape May, and Black-throated Blue Warblers. 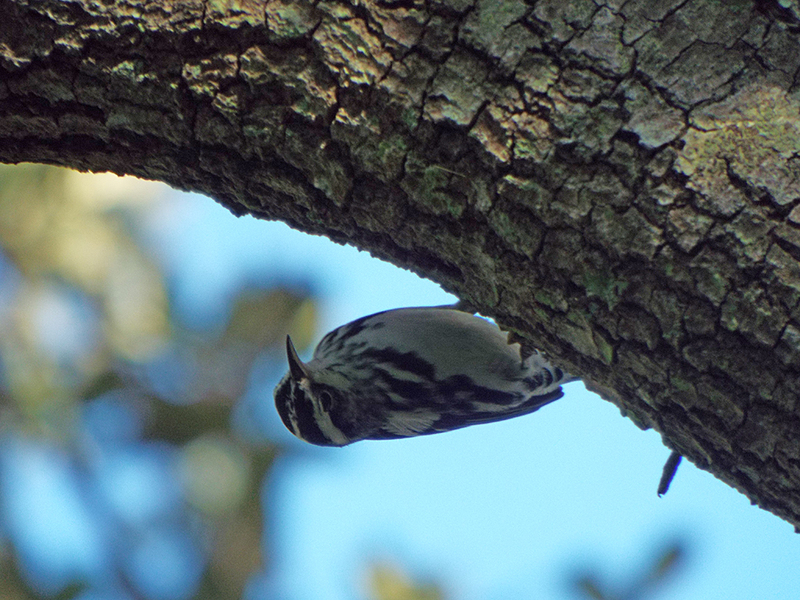 Black-and-White Warbler hanging out on an oak tree. When there are small birds concentrated in an area, you can bet small raptors aren’t far away. 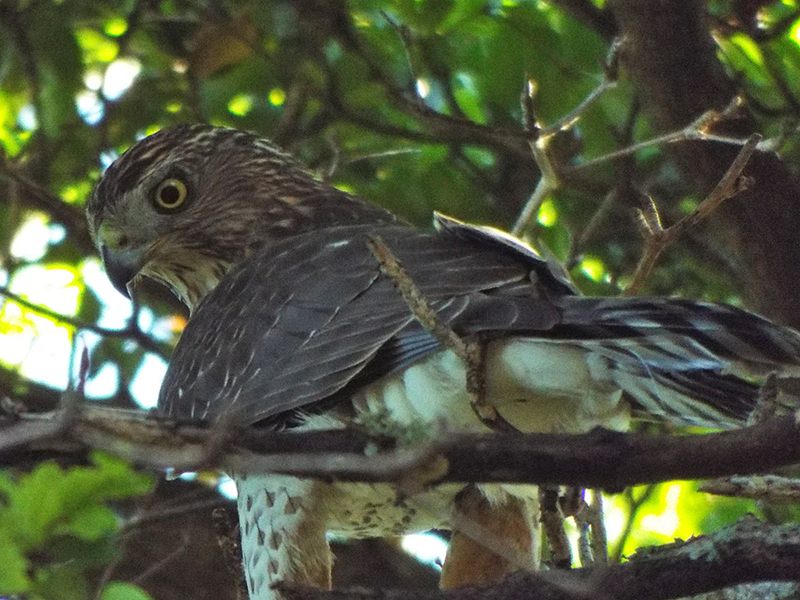 This Cooper’s Hawk was trying to hide from mobbing Blue Jays. A young Cooper’s Hawk learned a lesson in patience and camoflage after getting chased around by angry Blue Jays. A small Peregrine Falcon was also cruising over and around the cemetery, as well as a couple of American Kestrels. 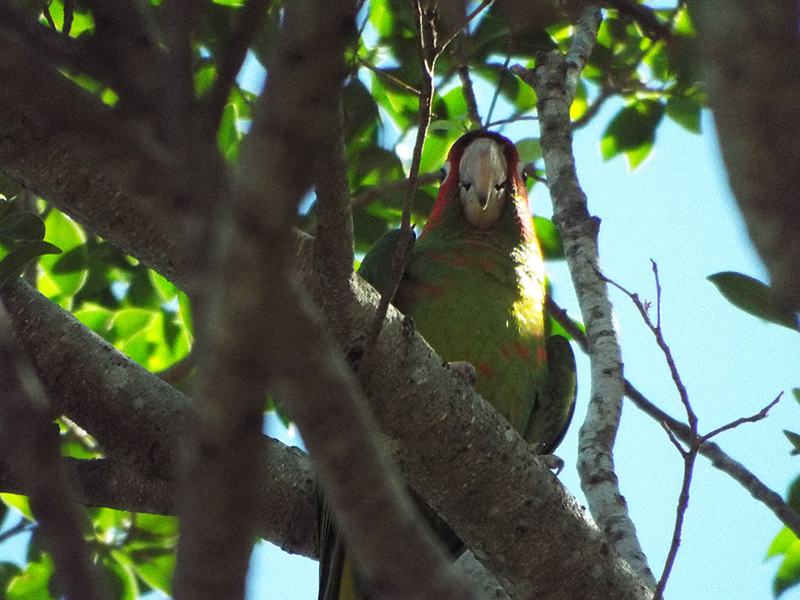 From Ft. Lauderdale we headed to South Miami to find exotic parrot species and track down White-crowned Pigeons. These pigeons are always showing up on eBird alerts and in e-mailing list reports, but each trip either of us has made to south Florida has come up with no White-crowned Pigeons. I’ll save you the suspense: We didn’t see any on this trip either. But we did get some parrots! 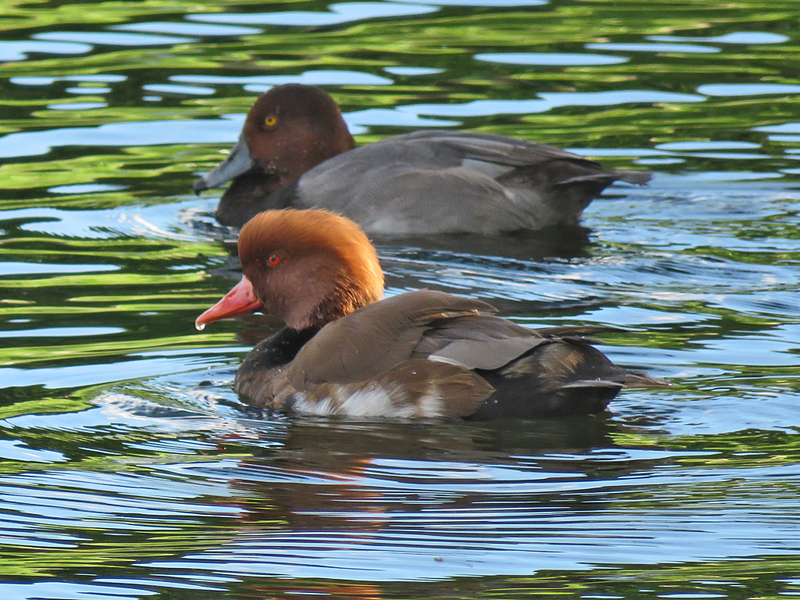 At the Baptist Hospital [map], we had almost given up on seeing any birds at all, besides the numerous Muscovy Ducks. 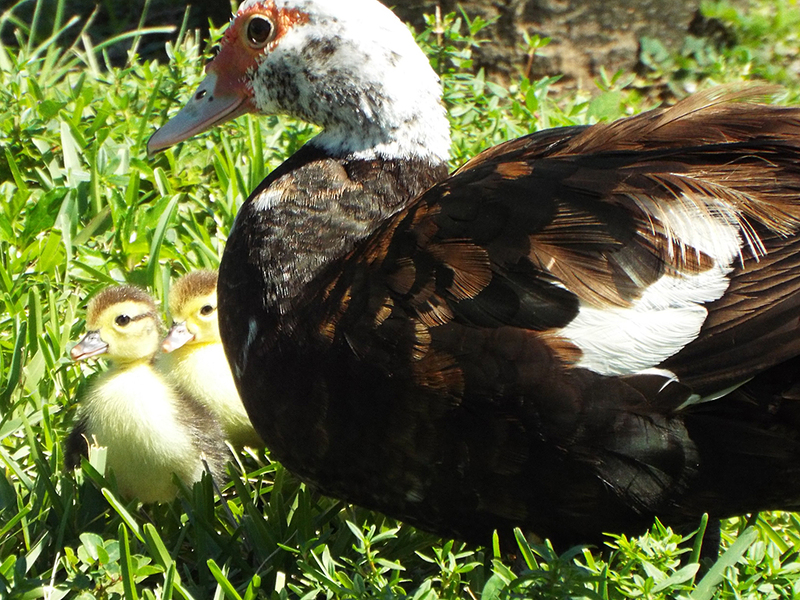 There were Muscovy Ducks with chicks of all ages around the ponds at the hospital. These two chicks were part of a group of 8 or so siblings and their mother (standing protectively here). But on our second look around, a large flock of loud Mitred Parakeets flew into a tree in the parking lot. Several minutes later, another large flock flew into a second tree. These parrots are extremely loud, and at times they synchronized their calls into a raucous, rollicking cacophony. 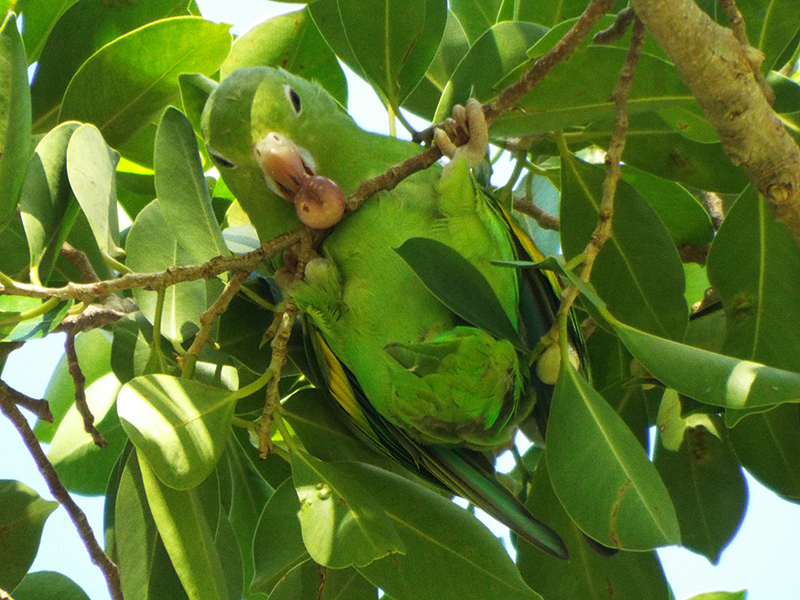 Mitred Parakeet on an exposed branch. Most of the birds stayed hidden (and cool) in the denser foliage. Mitred Parakeet watching the watchers. On the opposite side of the larger pond some more Mitred Parakeets flew in, joining a pair of smaller parrots, which turned out to be Yellow-chevroned Parakeets. 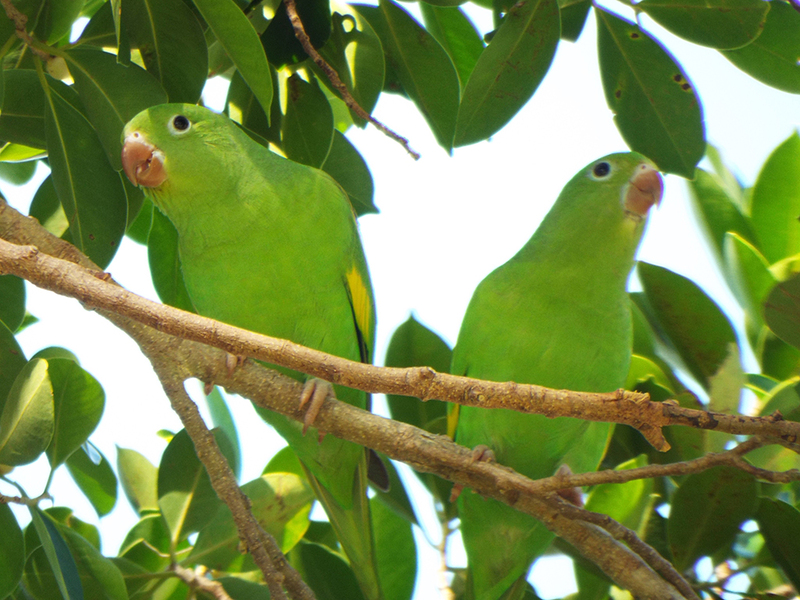 A pair of Yellow-chevroned Parakeets. An acrobatic Yellow-chevroned Parakeet eating its lunch. 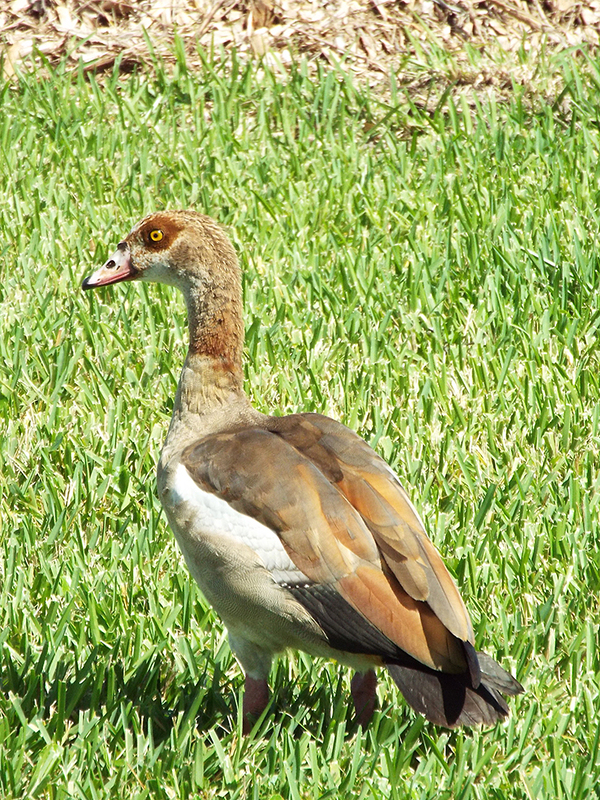 A few other feathered friends were around, including a small flock of Egyptian Geese. They were a bit flighty (no pun intended), but one bird was bolder and even struck some poses for us. 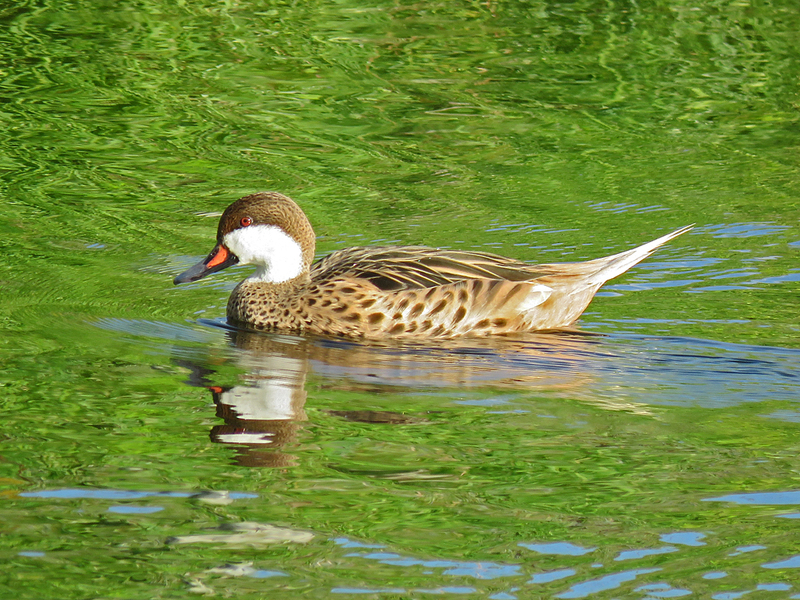 There were some domestic waterfowl, as well. 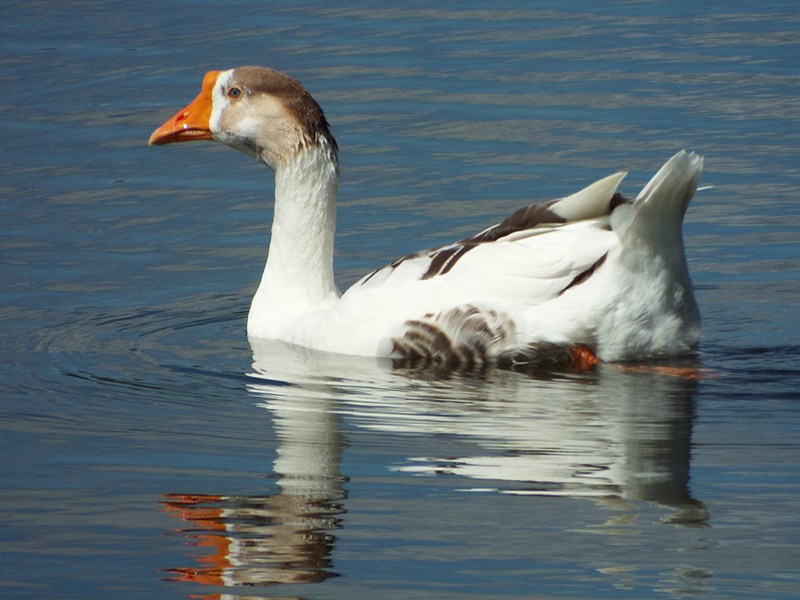 I was hoping for a Greylag Goose, and this bird was the closest I could find. 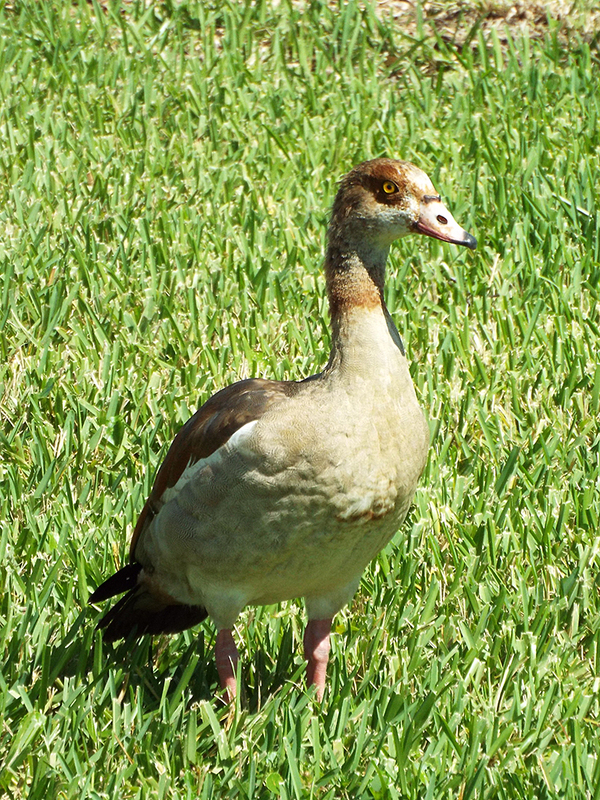 The extensive white is evidence of domestication in this bird’s lineage. From the hospital area, we went in to a few of the area neighborhoods, which are known to host warblers as well as established exotics, like Spot-breasted Orioles and Red-whiskered Bulbuls. At the King’s Creek Village [map] townhouse development, we had some success! The last time we visited this area, we saw a Red-whiskered Bulbul, but were unable to photograph it. This time, we were ready! One of several Red-whiskered Bulbuls in the neighborhood. 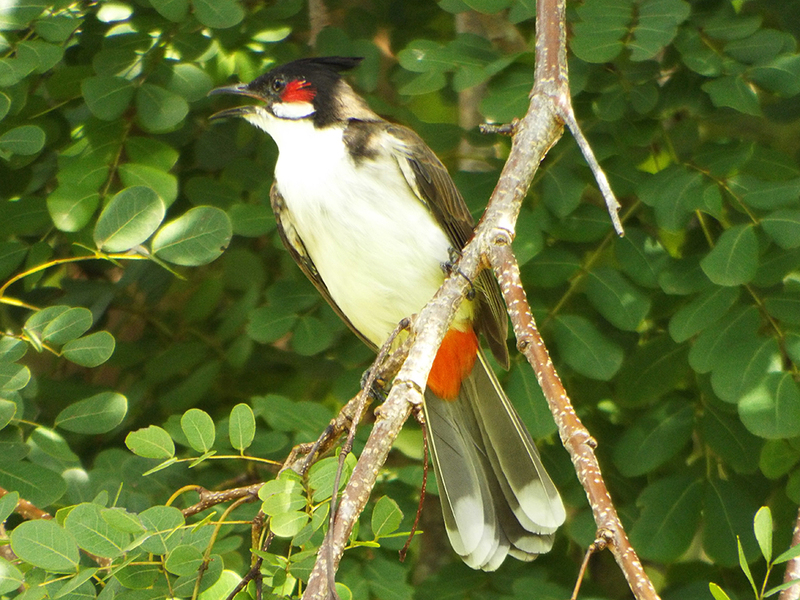 Bulbuls are native to south Asia, but are doing well in suburban Miami. 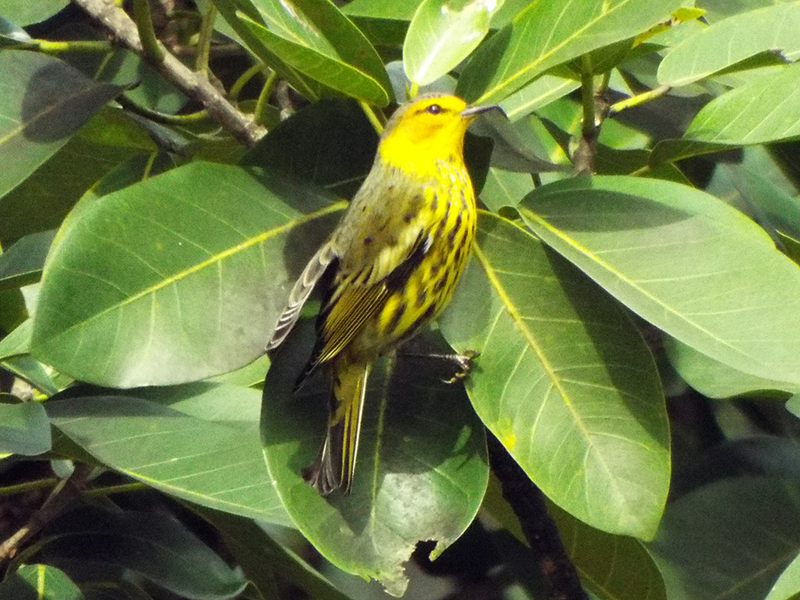 Among the more common Palm Warblers and Northern Parulas, we also saw Cape May and Blackburnian Warblers, and one real rarity: A Nashville Warbler. 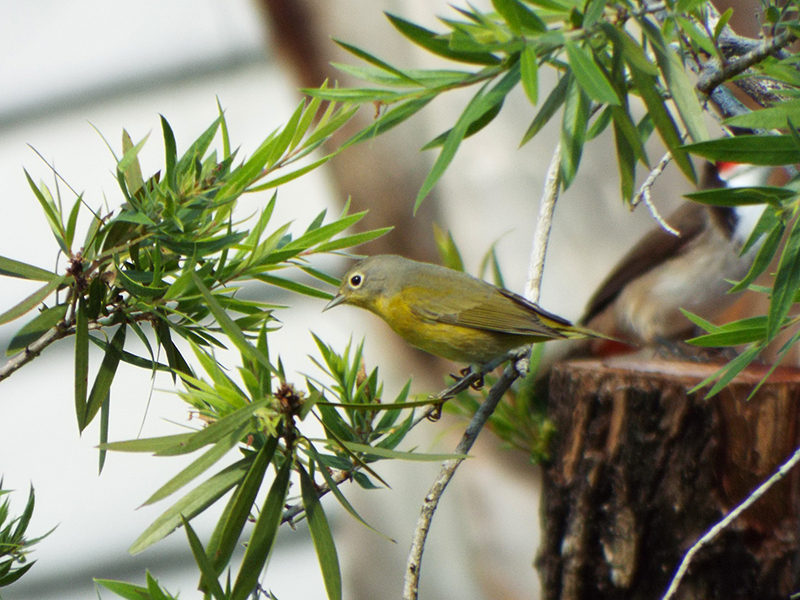 A rare Nashville Warbler feeding on an ornamental. 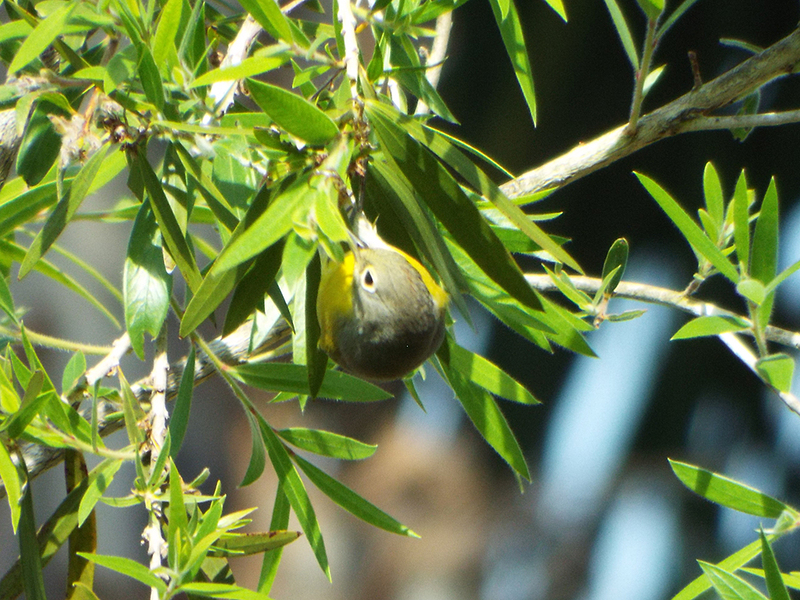 This Nashville Warbler’s bright yellow belly really stood out in the sunlight. After King’s Creek Village, we made two more stops, hoping to get White-crowned Pigeons and more parrots. At Ocean Bank [map] (a very urban setting), there have been White-chevroned Parakeets roosting just outside the atrium. We did not see them, but we did see some Common Mynas with nesting materials in a billboard structure. We then made our way to the Miller Drive parrot roost [map], hoping to get more parrot species as they came in for the night. Unfortunately there were not many parrots, though we were treated to a fly by of a flock Red-masked Parakeets as the sun set. While we were waiting to see what parrots would flock in, we saw more warblers and even some non-avian friends. 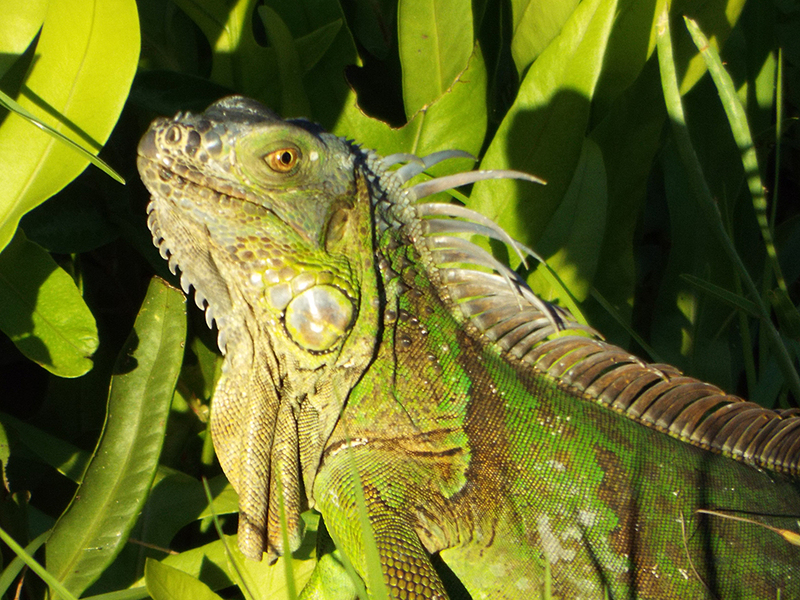 Iguanas are a common introduced species in south Florida. 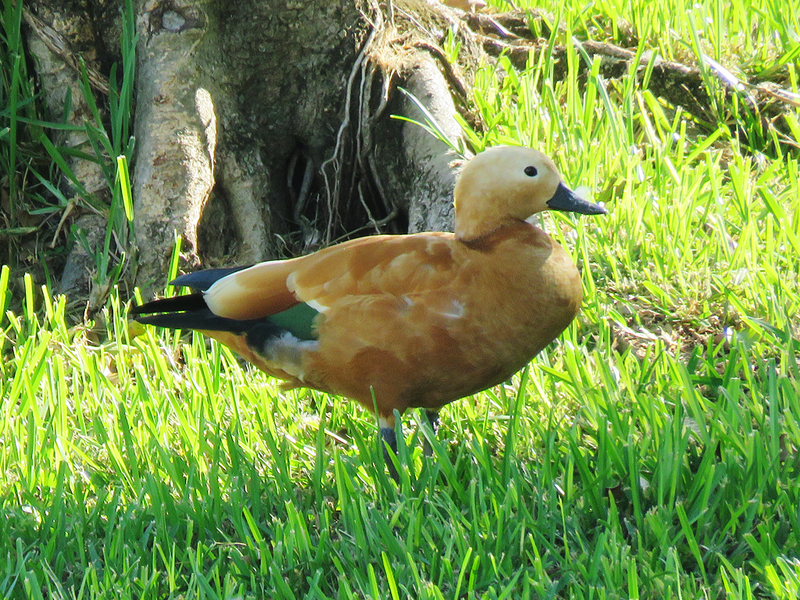 In addition to some large specimens at Evergreen Cemetery, this one was hanging around the canal. When it was clear there would be minimal roosting going on at this particular place, we made our way to Fuch’s Park [map], which is often an alternate roost site. But when we arrived there, it was dead quiet, with no parrots (and very few birds) present. The sun was setting by now, and it was time to head home. Day trips to south Florida are always long, but rewarding. We never got our White-crowned Pigeon (deemed a “common” bird by some), and I joke that it’s a cryptid, like Big Foot. But I’ll be back to get it, along with the elusive Mangrove Cuckoo. There are plenty of birding adventures to be had before then! As I mentioned in my last post, I’ve had a couple of bigger birding adventures this fall. Two weeks ago, in a push to try and see some south Florida exotics and specialties, Camille and I went to the Miami area for a day trip. Our main goal was to find Spot-breasted Orioles, Red-whiskered Bulbuls, White-crowned Pigeons, and Common Mynas. Parrots were also a good possibility. Hurricane Matthew had passed offshore the week before. There was still evidence of coastal flooding and inundation here and there, but no major damage that I could see. We stopped at A.D. Barnes Park [map] first, since there had been a report of a Sulphur-bellied Flycatcher there several days before. Unfortunately, we struck out with that bird, and we dodged raindrops and tough lighting most of the morning. 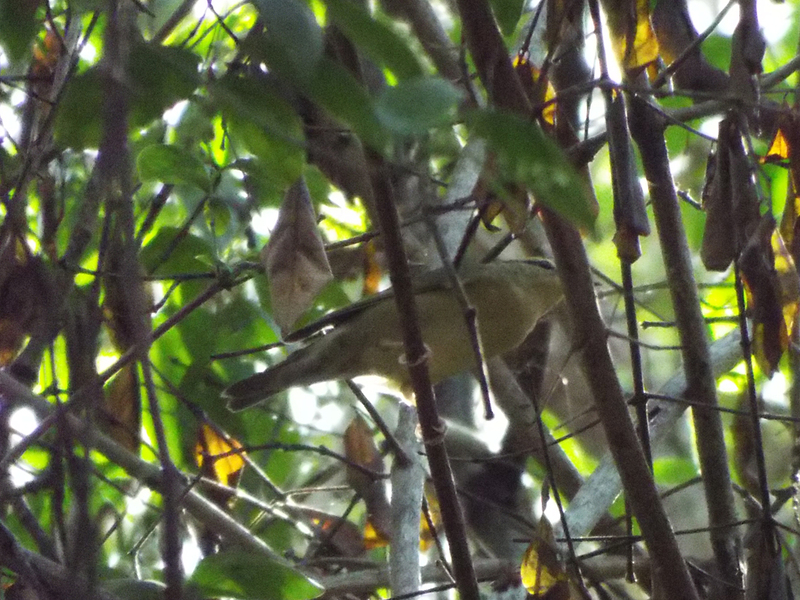 Palm Warblers were really hopping about in many places, here for their winter stay. There were a few different warbler species in the wooded sections of the park, including by the nature center, but nothing in large numbers. 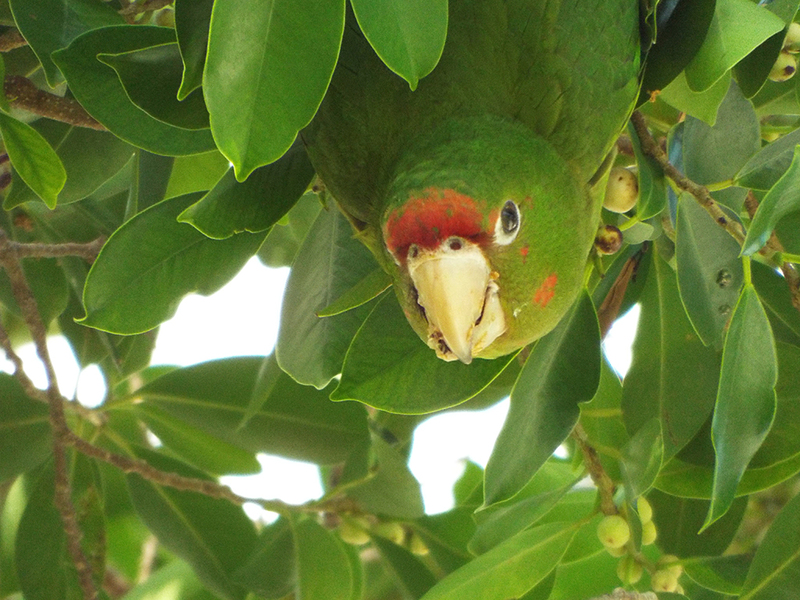 Some parrots would circle nearby from time to time, but the canopy kept us from identifying which species it was. 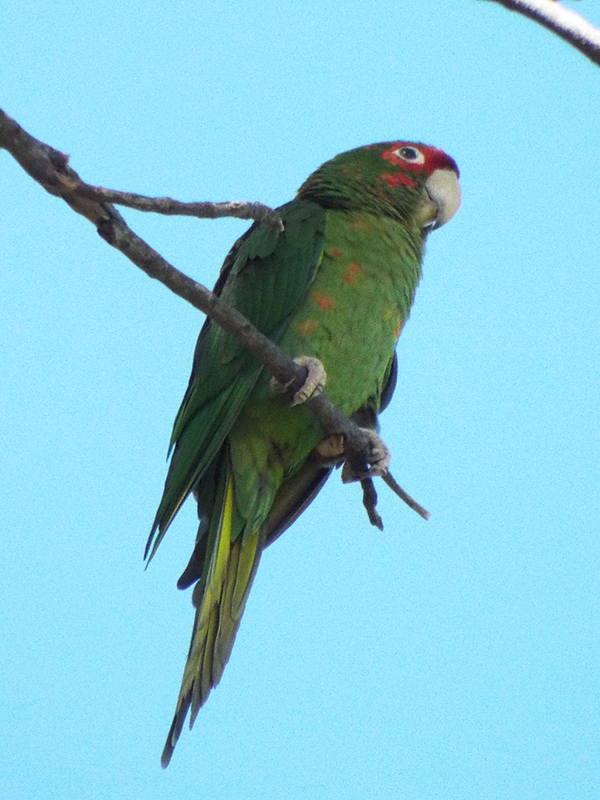 There are several established parrot species now in south Florida, including the now familiar Monk Parakeets (also known as Quaker Parrots) and Blue and Gold Macaws. 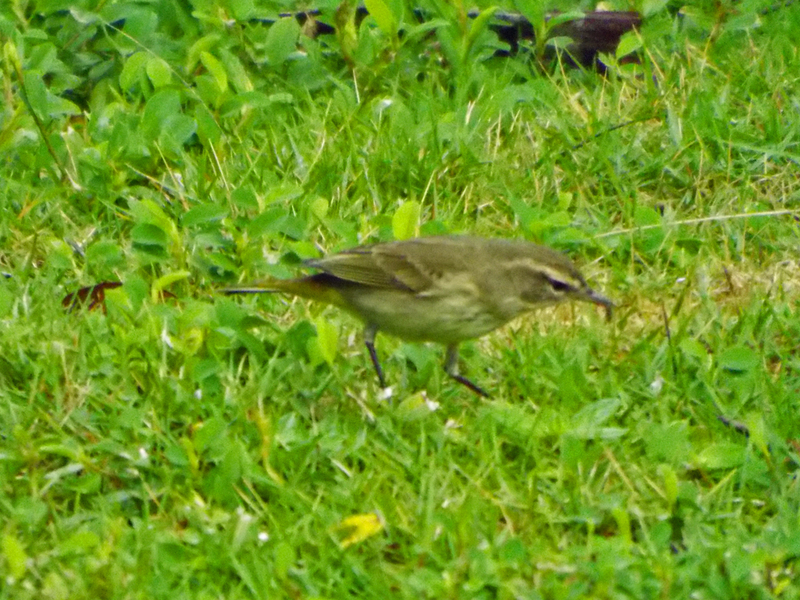 This Worm-eating Warbler may not be as flashy as a parrot, but it was a nice find. 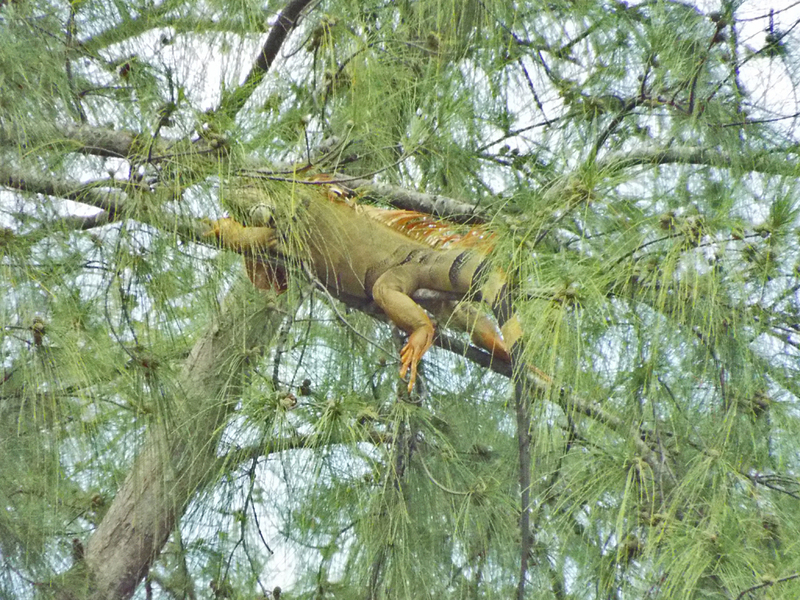 At the other end of the park, I looked in one of the trees over a pond and thought someone had lofted a pool-toy raft into the branches, but it turns out it was an iguana! This invasive species (introduced via escaped or released pets) can grow several feet long. They often lounge in the trees, I’ve been told. 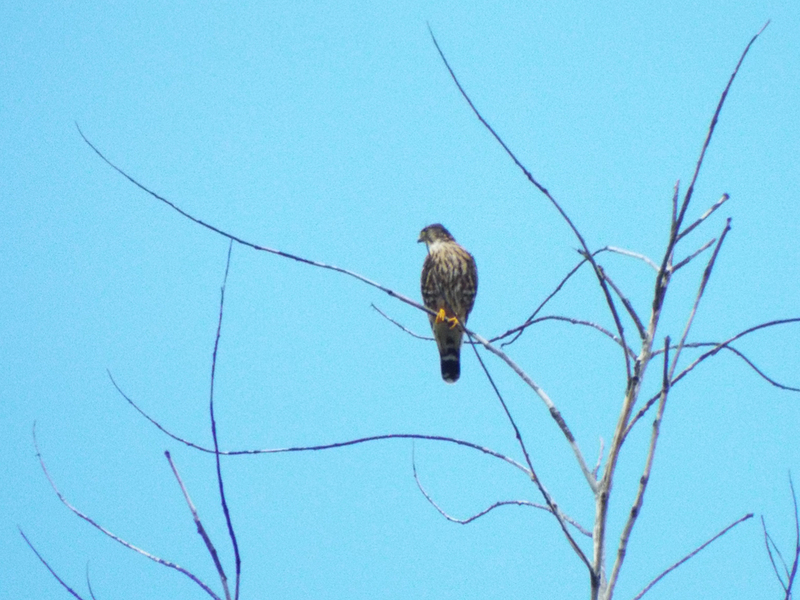 There was also a Merlin being harassed by a flock of Blue Jays. Eventually the jays gave up and the little raptor staked out some lookout perches high above the park, but it was very wary of us and kept flying off a bit as we approached. This photo was the closest it let us get before flying off and out of sight. Merlins arrive in October and generally stay the winter. Our last birds in the park were some Northern Parulas, Chestnut-sided Warblers, and a pair of male Cape May Warblers, still sporting some bright yellows. One of two Cape May Warblers, enjoying berries from ornamental plant in the park. After leaving the park, we headed for some neighborhoods in the Dadeland/Kendall area of Miami [map], hoping to find the exotic species I mentioned at the start of the post. 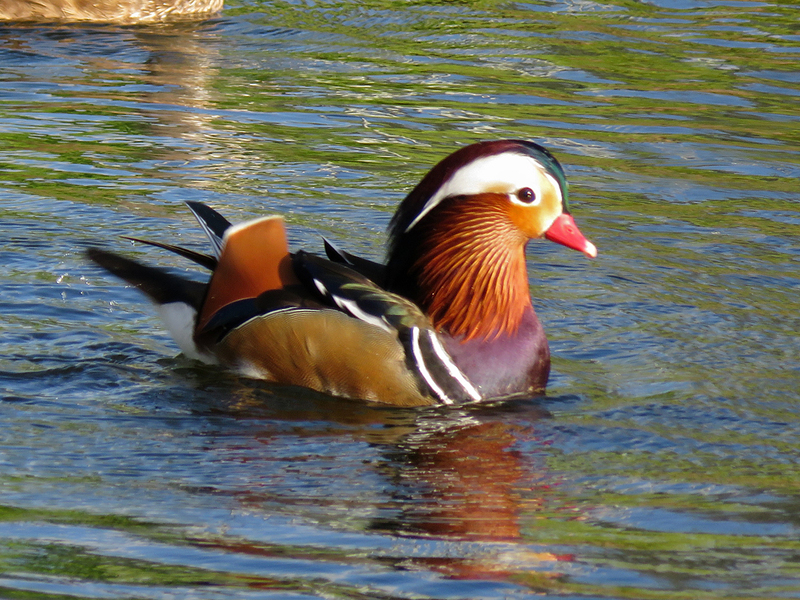 These birds were somewhat hard to get good looks at, since they tend to hang out in peoples yards or behind houses. 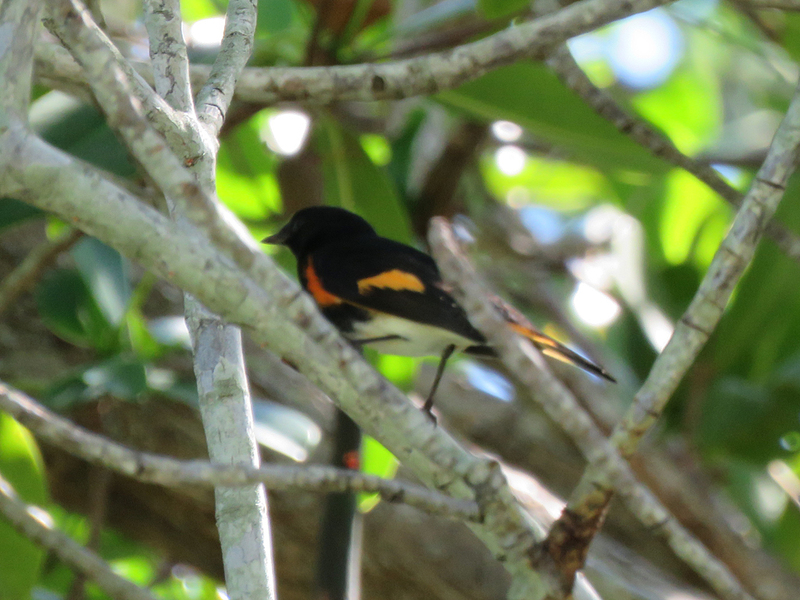 I did get a quick look at a Spot-breasted Oriole in someone’s tree, and there were the typical mockingbirds and cardinals. We did see a White-winged Dove as well as a Loggerhead Shrike, too. 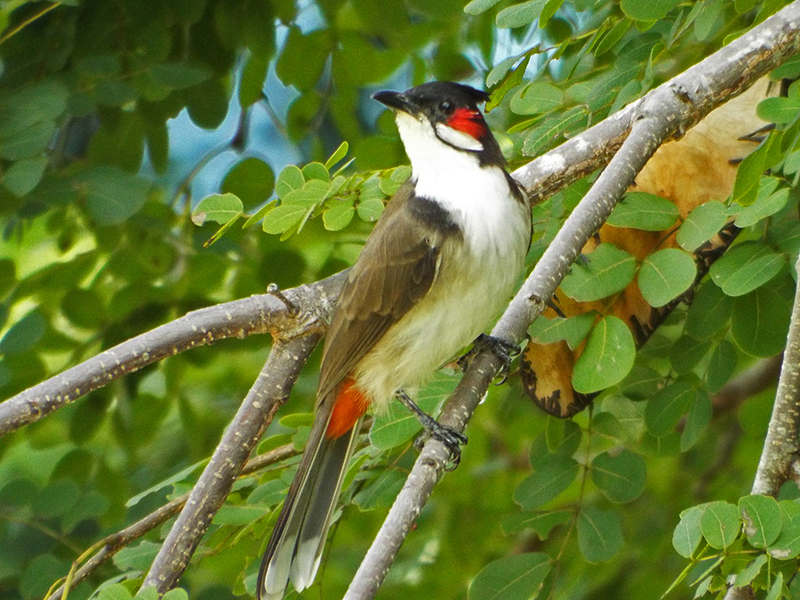 At the King’s Creek Village subdivision we were surprised by a Red-whiskered Bulbul that was flycatching from a fruit tree of some sort. We had initially walked into the area behind some apartments to scout it out, and the bulbul surprised us. It stayed in plain sight until I ran back to the vehicle to get my camera. On my return to the immediate area, it of course flew off never to be seen again! After that, we cruised around a bit looking in on places where Common Mynas had been seen recently (they are scattered all around the city). At one commercial area we pulled in and noticed a large amount of blackbirds in a parking lot, many of the birds standing under vehicles. Many of the birds were Boat-tailed Grackles, but the smaller blackbirds gave me a double-take. 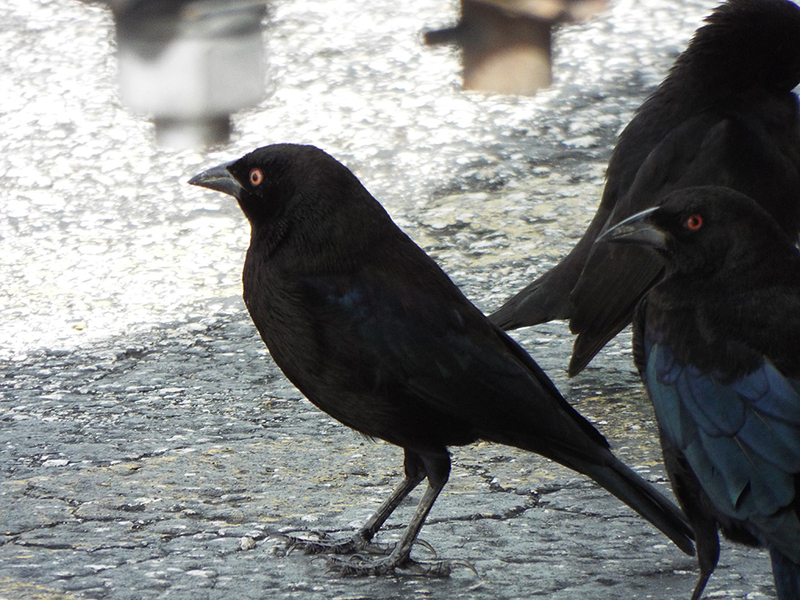 What I at first thought were Common Grackles were in fact Bronzed Cowbirds. It turns out that this particular location is a known hangout for them. 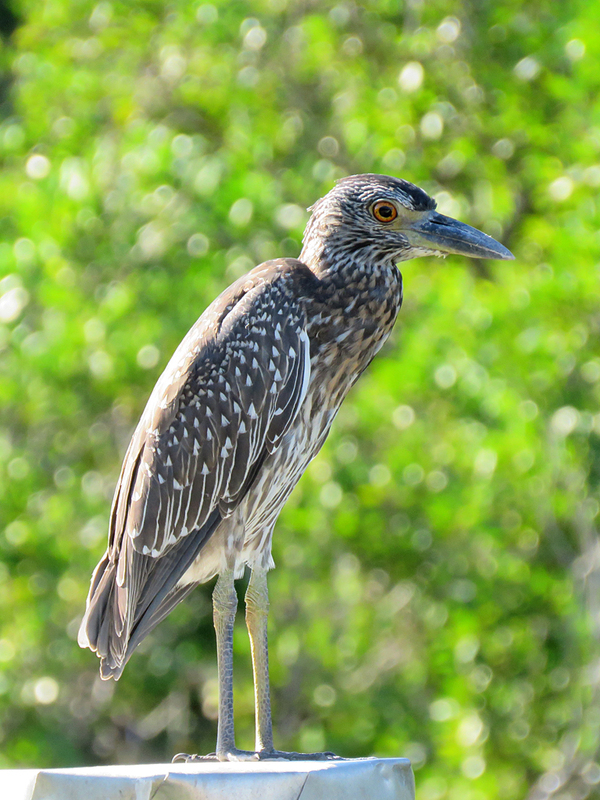 These birds are rare at the Space Coast, though, so it was pretty exciting. I love this pair of photos, because they show how different most blackbirds look in direct sunlight vs. indirect light. You can see why Bronzed Cowbirds are so-named when they are in direct sunlight. 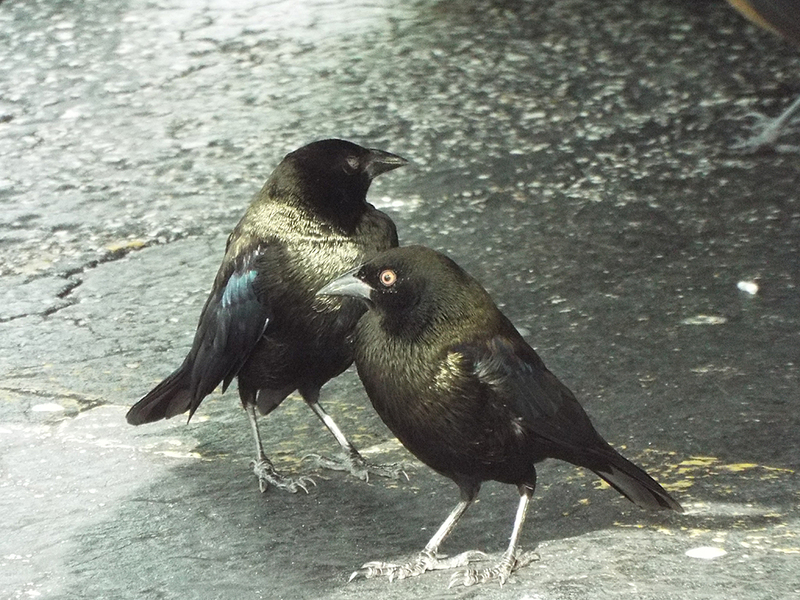 Bronzed Cowbirds looking “none more black” in the shade. I love the grumpy expression on the bird on the right! We stopped for gas on NW 42nd avenue, near where some recent Common Myna sightings were listed in eBird. While filling up, sure enough, there was a myna on a used car lot sign! In fact, here’s a Google Street View of the exact sign (I know, sorry replacement for an actual photo of the bird). Zoom out of Street View to see the location on the map. If you’re counting (and I was), that’s three lifers – the Spot-breasted Oriole, the Red-whiskered Bulbul, and a Common Myna. We then made our way to the area around Matheson Hammock Park [map], including “the round beach”. There was still evidence of Hurricane Matthew’s presence here, which made some exploration a bit interesting, due to expanses of mud, plant debris, and coconuts. 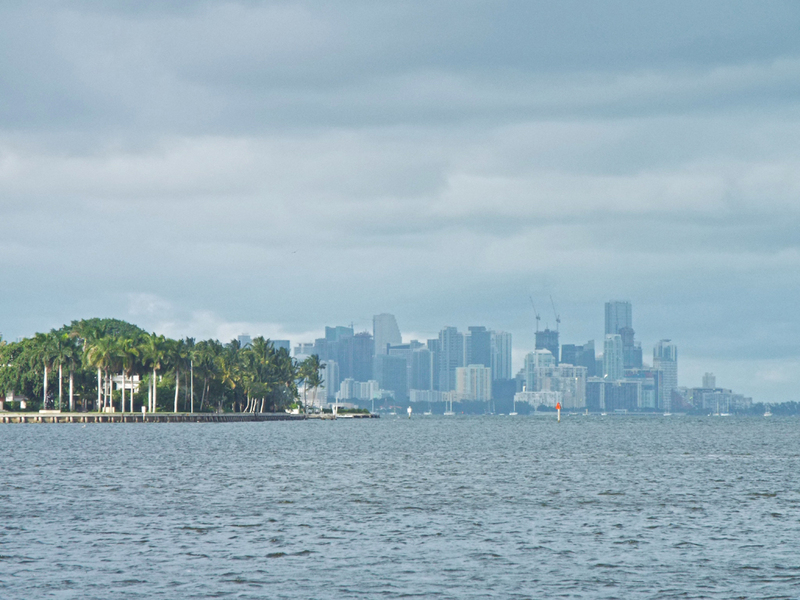 Part of downtown Miami from the beach near Matheson Hammock. The wind was really picking up, keeping many of the small birds down, but the more powerful aerialists were about, either kiting high up above the shore, making high-speed runs with a tail-wind, or roosting, bodies bent into the wind. 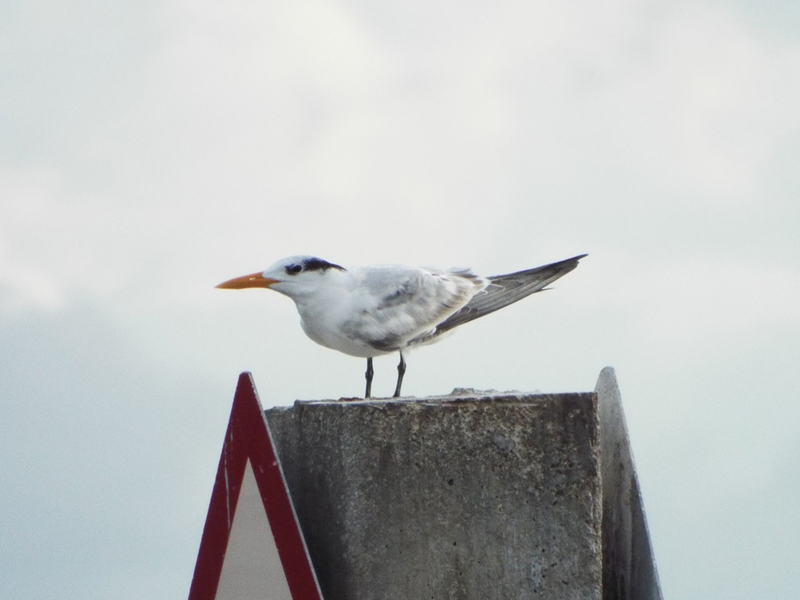 This Royal Tern is in “winter” plumage, with a white forehead and black nape feathers (I think it looks like Patrick Stewart). The buffeting wind didn’t seem to bother it much. The sea-spray was really starting to fly, and more heavy showers were in the area, as we decided to head out. 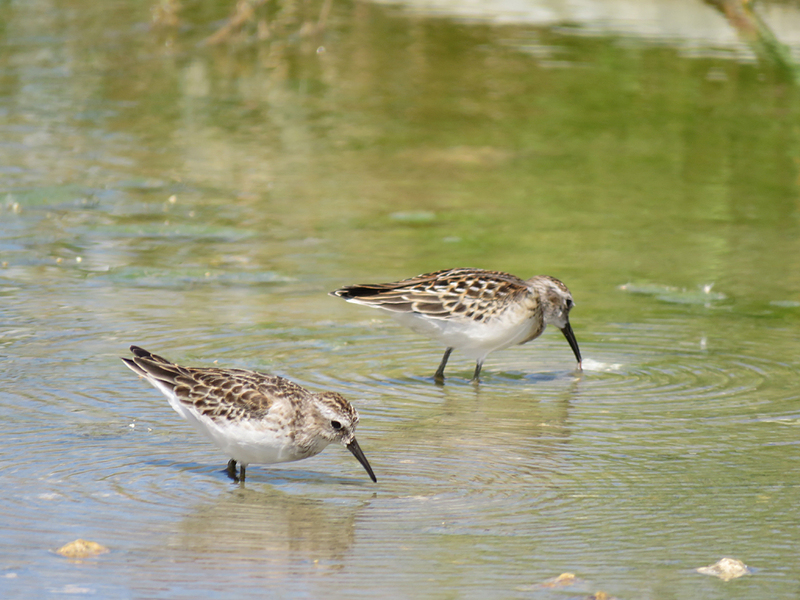 A few shorebirds were sheltering behind some sea walls or low vegetation. 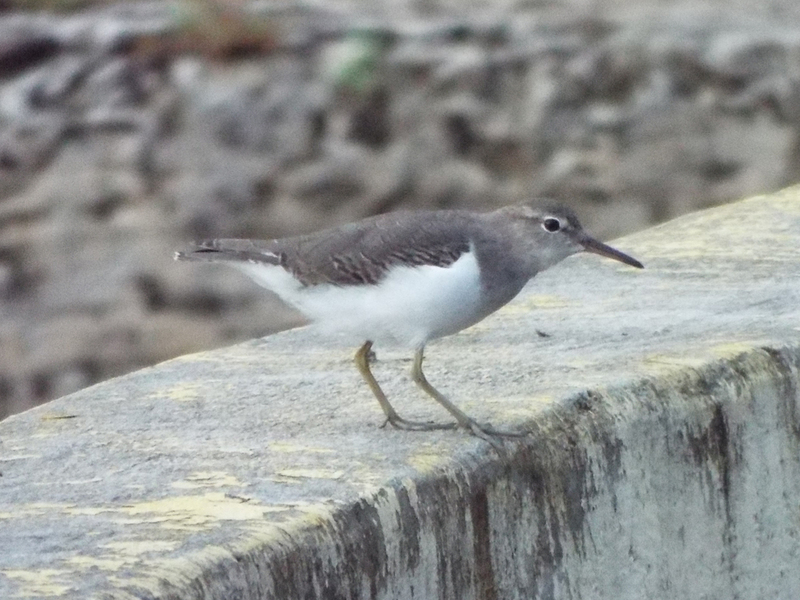 An “Unspotted” Sandpiper on top of a short sea wall. Spotted Sandpipers lose their spots over the winter, but their overall shape and constant tail-bobbing makes them easy to identify. Our day wasn’t quite over yet. Earlier in the day, at A.D. Barnes Park, we noticed two young, abandoned cats. I realize cats and birding are a real hot-button issue these days, and I’m not going to get into any of the politics of it here. Suffice it to say that we had it in our minds to return and get these cats out of the park and fostered or adopted. We did go back and managed to get one of the cats, but the other was much more evasive. The cat we did catch is now spayed and living inside a safe and loving home. It was a long day, but rewarding all the same. I managed 3 life birds and got a cat off the “streets” and out of the park. I also learned my lesson to be better prepared for unexpected sighting opportunities. I’ll have to go back to Miami and get my Red-whiskered Bulbul photo, plus there are more south Florida specialties to find.